Hillary Clinton and Michelle Obama get together to advance a bold agenda. Plus: Clinton 2016? 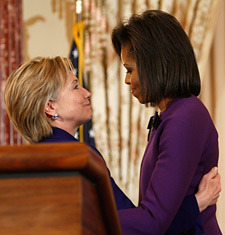 U.S. first lady Michelle Obama (R) hugs Secretary of State Hillary Clinton during a ceremony announcing this year's recipients of the Secretary of State's Award for International Women of Courage in Washington March 11, 2009. Pinch me. I'm watching a lovefest between Secretary of State Hillary Clinton and first lady Michelle Obama as they celebrate Women's History Month at the State Department. Having lived through crazy coverage of their alleged enmity last year – and honestly, I wouldn't be surprised if feelings flared during the bitter primary – it's a thrill to watch them work together on global women's rights issues with such obvious warmth between them. Melanne Verveer, the former Clinton chief of staff who's been running the indispensable Vital Voices, devoted to women's rights and empowerment around the world, was announced as Clinton's new ambassador for Global Women's Issues. Meanwhile, President Obama tapped his confidante, Valerie Jarrett, to run an Interagency Task Force on Women and Girls. I also enjoyed learning from the New York Times profile of Sen. Kirsten Gillibrand that "hard-core Hillary supporters are fully expecting her to run again in 2016," according to a New York official with "deep Clinton ties." That seems like a long way off, but it's interesting nonetheless. I met Gillibrand at an event in San Francisco Sunday and I was impressed by her; I'll say more when I learn more. Obama still has a big mess ahead of him, but it's been impressive to watch the best of the Clinton and Obama teams come together. There is no more important thing we can do for developing countries than improve conditions for women, and after years of hearing that rhetoric, it's great to know the country and the State Department are being run by people who believe it. The March madness of last year seems like decades ago, doesn't it?